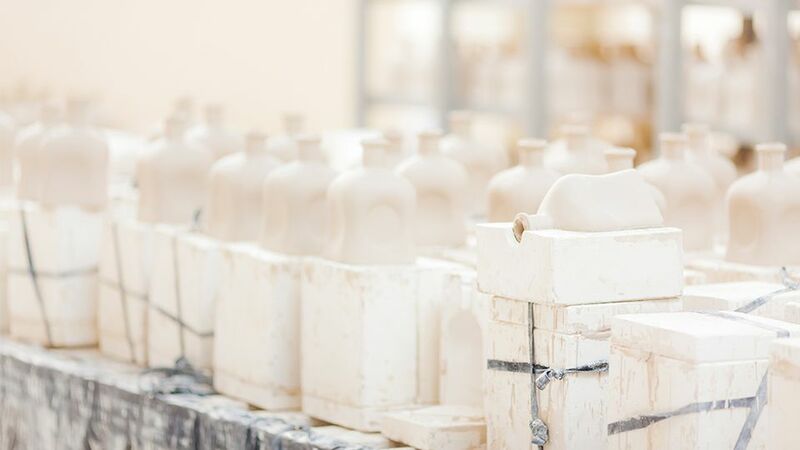 Slip casting facilitates the mass producing of ceramics, but doesn’t need any particularly specialist equipment and can be done in the studio. Dependent on how many molds you have, slip casting can create hundreds of identical pieces. Some potters tend favor this method, as slip casting makes pieces that are tricky to hand build or create on the wheel much easier. Another brilliant benefit of slip casting is that you can make wares like a jug with a handle as a single piece. Slip casting is also a great method to create more complicated pieces, such as a teapot. Slip is just a liquid mixture of clay or a "liquefied suspension of clay particles in water" and is generally a little thinner than a slurry. Slip casting is "liquified clay poured into a plaster mold." The ratios are roughly 75 percent clay body to 25 percent water. The process of transforming your clay into a slip is called the slaking process. It’s important to use the same types of clay so it can be successfully fired at the same temperature. Work out the quantities of clay and water you need and add them to a large bucket, leaving them to slake (disintegrate). Different clays have different slaking times, but you should leave the clay to dissolve in the water for around 24 hours. The clay should be bone dry for this process. After this time, the mixture will need to be stirred gently with a large stick. To create the ideal consistency (your slip should be thickness of cream), you’ll need a drill with a mixing attachment to make sure the slip is smooth. It’s important to work out if the slip has the correct clay to water ratio (known as its specific gravity). To measure the specific gravity, you’ll need to pour 100 ml of your clay slip into a measuring jug and weigh it in grams. Then divide the weight you get by 100 (or the amount of milliliters you have poured out) and that number will be your specific gravity. A good ratio to work with is roughly 1.80. Then you’ll need to make sure the clay is deflocculated. Chemicals need to be added to the clay slip so that it has the correct fluidity. This is known as deflocculation. Deflocculation is to "disperse the particles in a slip so that less water is required to make the slip fluid." A few drops of sodium silicate can be used to achieve this. A liquid deflocculant like Darvan is also good, as it will not erode a plaster mold. Wear a respirator mask throughout the whole process of turning your clay body into slip, so as you do not inhale any harmful chemicals. Once your slip is the correct consistency, then you’ll need to have the right plaster mold ready. Plaster molds are readily available to buy or you can follow our tips and tricks to making your own plaster mold. Molds are made from plaster of Paris as they’re highly absorbent. Carefully pour your slip into the cavity of the mold and the plaster of Paris mold will start to absorb water from the clay and the drying process of the clay will begin. Once the clay has started to dry to a suitable thickness (the timing will depend on the size of the mold, but for a medium/small mold, 10 minutes should do), then you can pour out the excess clay slip. There is a knack to pouring out the clay slip and you’ll need to do it very carefully. Pour it back into the bucket of your clay slip, so as not to waste any. When pouring, put two pieces of wood above the bucket to rest the plaster of Paris mold on, upside down, so the slip pours out evenly. Some potters recommend pouring the slip out at an angle, so that the inside is even smoother. Once it’s all poured out, then slice off any excess clay from the top of the mold. Once the piece is dry, (the length of time the clay takes to dry will be dependent on the size of the mold you use) you can tip it out. Place a flat board underneath the mold and carefully turn it over. This is the easiest method and the piece should gently come out, as the clay will have shrunk in the mold. From there you can tidy up the edges and your piece will be ready for firing and glazing. Should You Invest in a Pug Mill for Your Pottery Studio?